Nine months in front of the Final Draw for the 2014 FIFA World Cup Brazil™, no less than 24 qualifying matches are scheduled in the European Zone on Friday, as the stakes for competing teams get increasingly higher. In the 5th round interesting will be duel in Zenica, where leaders Bosnia-Herzegovina welcome second-placed Greece in Group G. Elsewhere, a potentially extreme Balkan derby between Croatia and Serbia awaits in Group A, while in Group F Portugal will try to make up a five-point gap on unbeaten Russia when embarking on an awkward-looking trip to Israel. “I’d like to ask the fans to create an atmosphere based on love for the Croatian national team rather than hate for our opponents over the next few days. Our duty is to promote football, and it’s the only objective that we’re concentrating on.” These were the words of Igor Stimac, coach of a Croatian side that currently sits joint top of Group A with Belgium and hosts neighbours Serbia on Friday evening. As a security measure, no Serbian supporters have been allowed to travel to Zagreb for the encounter. 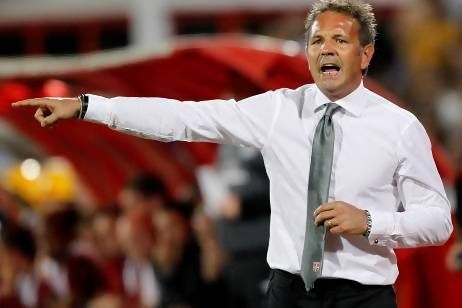 Meanwhile, opposing coach Sinisa Mihajlovic, who has reduced the average age of the Serbia squad significantly since taking over in May 2012, is hoping to use the contest as a springboard for a team that has struggled to find its feet since the international retirements of Nemanja Vidic and Dejan Stankovic. The possibility of the Balkan rivals taking points off each other leaves the door open for Belgium to go clear at the top of the pool. To do that, the Diables Rouges will have to overcome a Macedonia side that recorded a surprising 3-0 friendly win over Denmark recently. Finally, new Scotland manager Gordon Strachan, who amassed 50 caps during an impressive playing career, will aim to secure a much-needed victory over Wales in the 55-year-old’s first competitive outing in charge. With leaders Italy absent from this round of fixtures, Bulgaria can cut the gap at the top to one point by beating Malta at home, although they will have played a game more than La Nazionale. The Czech Republic will welcome back their skipper Tomas Rosicky (88 caps, 20 goals), which should help them to achieve two aims: defeating Denmark and thereby practically eliminating the Scandinavians, who have yet to win a match, and moving within two points of Italy, having played the same number of games. With Germany set to face modest Kazakhstan twice in the space of four days, it is likely that Joachim Low’s men will have extended their lead at the top of the section come Tuesday night. Sweden, however, should not be discounted. Still undefeated, they lie three points behind the Germans with a game in hand, and could strike a serious blow to the qualifying hopes of Giovanni Trapattoni’s Republic of Ireland with a victory in Solna. Battling for second place behind a Dutch contingent that are highly likely to maintain their 100 per cent record versus Estonia, Hungary and Romania square off in Budapest in what is undoubtedly Friday’s most attractive-looking Group D encounter. Elsewhere, Turkey, already six points behind the Hungarians and Romanians, travel to Andorra. In an extremely open pool where anything is still possible, Norway, who suffered a surprising 2-0 loss to Iceland last time out, will be hoping to take advantage of Switzerland’s non-involvement by overcoming Albania – traditionally poor away from home – and drawing level with the Helvetians on ten points. In Slovenia, home fans will lay out the welcome mat for newly installed national coach Srecko Katanec, a 49-year-old former international defender who already fulfilled the same role at UEFA EURO 2000 and at the 2002 FIFA World Cup. Portugal, currently third with seven points, five behind leaders Russia, will have little margin for error in their clash with Israel, who sit just above them on goal difference. For this tricky task, Portuguese coach Paulo Bento has called up midfielders Carlos Martins and Paulo Machado, as well as forwards Hugo Almeida, Pizzi and Vieirinha, but will have to make do without the injured Nani. One major positive for the away side is the presence of Cristiano Ronaldo, who should pick up his 102nd cap. The aforementioned Russians, meanwhile, travel to Northern Ireland looking to secure their fifth consecutive victory, with Fabio Capello’s men surely in confident mood after a comfortable 2-0 win over the same opponents in September 2012. The Italian supremo is expected to rely on the young Anzhi Makhachkala duo of Oleg Shatov and Fyodor Smolov, both 22, ahead of the more experienced Andrei Arshavin and Pavel Pogrebnyak. This critical clash between Group G’s two frontrunners pits a Bosnian side that has scored an average of nearly four goals in each of the four matches played so far and a Greek XI that has conceded just once in the campaign. Despite the presence of an impressive attacking triumvirate of Zvjezdan Misimovic, Edin Dzeko and Vedad Ibisevic, the Bosnians were unable to break down the Greek defence in October’s 0-0 draw in Piraeus. But on their favoured pitch in Zenica, Safet Susic’s charges are confident of beating Greece for the first time in their history and gaining some revenge over a team that defeated them during qualifying for the 1998 FIFA World Cup and UEFA EURO 2008. “It’s a crucial match for us. A home win would give us an enormous boost in terms of our confidence and our hopes for qualification,” said captain Misimovic. Lying three points behind Bosnia-Herzegovina and Greece, Slovakia need a win at home to Lithuania if they are to remain in the hunt for qualification. Four days before a tough-looking mission in Podgorica, England must first take on a less trying challenge in the shape of San Marino, while Montenegro, who top the group and lead the Three Lions by two points, head to Moldova. Roy Hodgson has had to deal with injuries to Aaron Lennon, Michael Dawson and Rio Ferdinand, who has not pulled on his country’s jersey since June 2011. Poland, who have a game in hand, can propel themselves back into contention by triumphing over winless Ukraine. With the big showdown on 26 March between France and Spain looming, both powerhouses will have the opportunity to indulge in some preparatory fine-tuning at home to Georgia and Finland respectively. The world champions, deprived of Iker Casillas and Carles Puyol through injury, have decided to rest Xavi, while French coach Didier Deschamps may involve precocious starlets Paul Pogba and Raphael Varane at some point on Friday.